The Gautier Meridian Circle was bought in 1899 with the funds gathered by the Commission for the funding of the Observatory which was established in 1896 by Demetrius Eginites, Director of the Observatory. The expenses for the purchase and the installation were provided by the Greek of Diaspora, Andreas Sygros (a total of 50,000 golden Francs; the price of the instrument was 26,600 golden Francs). The astronomer of the Observatory of Paris, Loevy was charged to supervise Gautier’s construction of the Meridian. The Meridian’s building was designed by the German Athens' town planner and architect Ernst Moritz Theodor Ziller (1837-1923). A pendulum and a chronographer were ordered to Auguste Fénon. 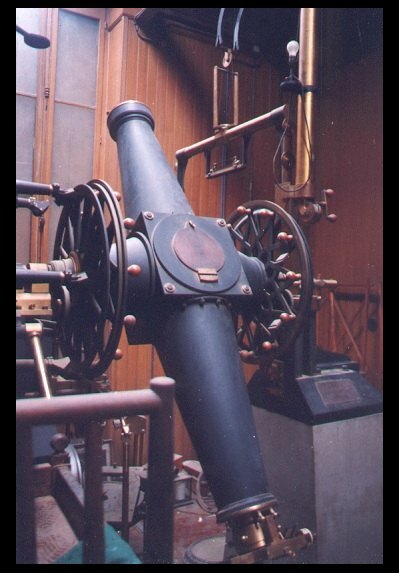 The Meridian telescope is used to determine the co-ordinates of celestial bodies. It rotates around a horizontal axis perpendicular to the meridian, so that it can only move along the meridian plane. The roof above the telescope opens in a manner so as to allow observation of celestial bodies situated on the meridian plane, from North to South. A micrometer is fitted to the telescope for the precise micrometric observation of a star passing through its field. Used in tandem with a stellar chronometer, it allows the observer to record the precise time when a celestial body crosses the meridian, i.e. the middle of the 5 filaments viewed in the micrometer's field. The wheel of the instrument served as a goniometer scale, so that the zenith angle as well as the polar distance of the body can be accurately measured. The Gautier meridian telescope has been mainly used by the master time service i.e. to accurately determine the time, which was a daily task of the Observatory (observatory standard time). Furthermore, it has been used to determine again and more precisely than with the old Starke Meridian the precise latitude and longitude of the Observatory, the reference for the mapping of Greece. For the purpose of specifying the time, an observer would refer to astronomy tables, so as to establish the precise time when a particular star would cross the meridian of Greenwich. Then, the transit circle would be set to a suitable polar distance (this also derived from astronomy tables), so that the particular star would cross the field of view of the telescope. Then, the observer would wait for the star to enter the field of view and at the time it would precisely cross the back of the micrometer's middle filament, and with the use of the Fénon chronographer he would note the time indicated by the Fénon pendulum. The longitude of the geodetic pillar (a few meters from the center of the Meridian) determined by D. Eginites in 1923, using wireless time signals from the transmitter of Lyon and later of Bordeaux Lafayette post, was found to be 1 h 34mn 51,921s from Grenwich. (On meridian circles see, Françoise Le Guet-Tully et Jean Davoigneau).